In addition to knowing why you want the job, the interviewer will assess your qualifications to determine if you're a match for what the employer is seeking in the candidates they hire. You will also be asked general questions about your strengths, weaknesses, communication, and interpersonal skills to assess whether you would fit in with other members of the squad. Preparation is the key to any successful interview. Review the list of frequently asked interview questions for firefighters below and practice delivering answers with a friend, counselor, or to the mirror. Think of concrete examples demonstrating how you have applied the related skills/personal qualities to your advantage in academic, volunteer, and work roles, and be prepared to share them with the interviewer. See below for a list of interview questions and a list of skills required to be hired as a firefighter. You have seen the job description. Which of the firefighting responsibilities would be most challenging for you? Describe any examples of your presentations to groups? Have you given any fire safety talks? What are the keys to preventing fires in public buildings? How would you describe your mechanical abilities? Give me some examples of when you have fixed things. Do you have experience as a volunteer firefighter? If so, how did this experience prepare you for this position? What do you believe are essential qualities in a firefighter? Describe a time when you had to solve a problem as a group. How did working with a group help you solve the problem? Tell me about a time when you had to make a decision in a very short amount of time. How did you handle the situation? Tell me about a time that you worked outside of your job profile to solve a problem. Tell me about a time that you served as a leader of a group. Give me an example of a situation when you saw someone in distress and helped him. Tell me about the most stressful job you ever held. How did you handle the stress? Tell me about a time when you helped handle a conflict between two of your colleagues. What is your routine for maintaining physical fitness? What would you do if a superior asked you to carry out an order which was outside departmental protocols? 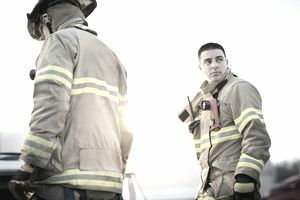 Here's a list of EMT (emergency medical technician) and firefighter skills for resumes, cover letters, and job interviews. Skills will vary based on the position for which you're applying.